NEW PRODUCT AVAILABLE MAY 1ST!! Energy Tools International (ETI) energetically infused herbal formulas are unique formulations that combine herbal extracts with trace minerals structured by specific subtle energy patterns created with the proprietary Vital Force Technology (VFT). 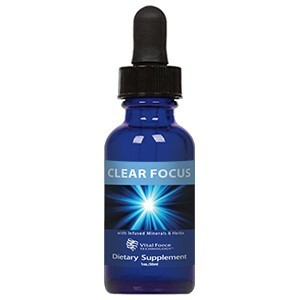 The minerals and herbs in this formula combine to work as a restorative tonic to support mental wellness, increase focus, promotes alertness, clarity, positive mood and overall vitality for optimum health. Based on scientific research on Gotu Kola, results show the herb benefits include: wound healing properties and positive effect on memory and focus. Recently recognized in the United States for its significance as an herb that supports maintenance cognition and vascular health. Several studies have been shown that Gotu kola promotes healthy memory functioning, focus, and alertness. Ginkgo, results show the herb benefits include: cognitive function support and enhanced memory in adults, as well as improves central and peripheral circulation. ETI uses proprietary Vital Force Technology (VFT) to improve products and services throughout the global wellness market. VFT is scientifically supported infusion technology used to increase uniqueness of product ingredient formulation. Some other supported benefits are improve the product’s intended effects and may enhance bio-availability of products. *These statements have not been evaluated by the Food and Drug Administration. This product is not intended to diagnose, treat, cure, or prevent any disease. For educational purposes only.